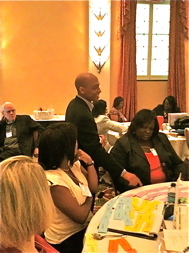 Consumer Action and Capital One co-hosted a MoneyWi$e regional meeting in New Orleans, Louisiana. MoneyWi$e curricula was developed by Consumer Action in partnership with Capital One. On October 16th, Consumer Action (CA) and Capital One co-hosted a MoneyWi$e regional meeting for community based organizations (CBOs) providing services to cities within the state of Louisiana. The training brought together 44 nonprofit staff, front line advocates, legal services representatives and educators to learn how to teach financial education to low-income adults. In a survey of attendees, 93% “strongly agreed” that the training had a good mix of lecture, discussion, and interaction among participants. The event began with a welcome from Ken McEldowney, Executive Director of Consumer Action, and Bert Davis, Senior Associate of National Volunteerism at Capital One. While McEldowney described the long and successful partnership between Consumer Action and Capital One, Mikael Wagner, CA’s Director of Outreach and Training, went over the contents of the MoneyWi$e toolkit, which includes brochures, leader’s guides, lesson plans and power point slides. Wagner’s discussion was followed by a guided tour of the ConsumerAction website and MoneyWi$e website from CA’s Associate Director of Outreach and Training, Audrey Perrott. Perrott encouraged participants to order Consumer Action’s free multilingual publications and to become members of Consumer Action. Depending on their contribution level, members can receive online updates on CA’s latest publications, current newsletters examining in-depth consumer issues, and email advocacy alerts if they so choose. Davis then gave an interactive presentation on how to teach adults. He explained that teaching adults is very different from teaching children, and reviewed the various ways in which adults learn best including by visual, auditory and psychomotor stimulation. Davis stressed the importance of keeping adults engaged by having them to do things. Wagner and CA Community Outreach Managers, Nelson Santiago and Linda Williams, later facilitated sessions on Rebuilding Credit, Good Credit and Money Management using a mix of lectures and hands-on activities. 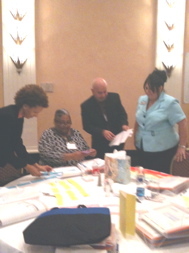 During the Money Management sessions, participants had the opportunity to develop a case financial management plan for a fictional character “Sally Walker.” The exercise employed a team-learning approach and reinforced the learning of the Money Management module, as well as introducing key concepts such as specialty consumer reports and identity theft to the group. After the teams convened and developed their plans for “Sally,” they shared their ideas with the entire group. During the Rebuilding Credit session, the Outreach Team used the “fish bowl” technique to teach. The “fish bowl” technique allows participants to teach one another. They are given the teaching tools and required to present the materials in small teams to the entire group. The “fish bowl” exercise helps group members gain the confidence they need to present the information to their communities. Participants thanked the Consumer Action team repeatedly for giving them this hands-on experience. After conducting regional meetings in Shreveport and New Orleans in May of 2008, Consumer Action staff was pleased and honored to return to the Bayou state. Although post-Katrina rebuilding has been slow in some of the areas hardest hit, the will to rebuild has not been receded. Many of the participants’ faces were familiar, as was their renewed commitment to change lives through financial education.